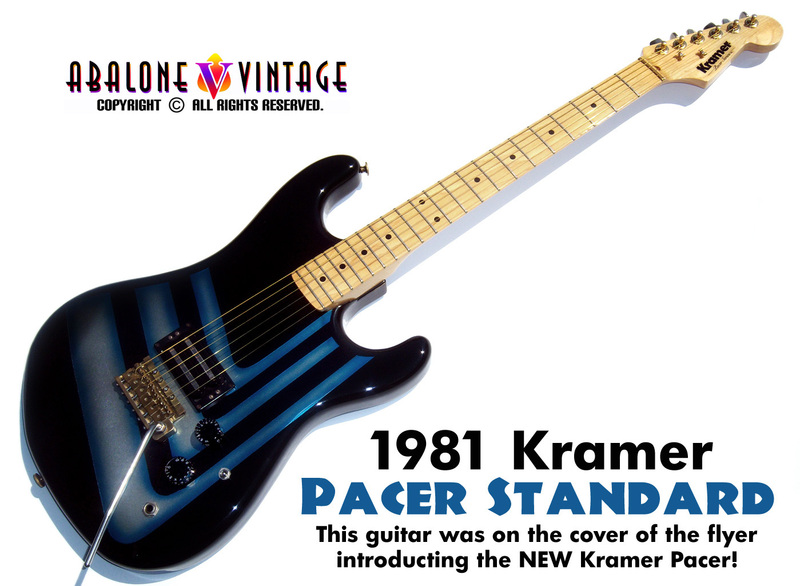 Photos of 80's Vintage Kramer Guitars. 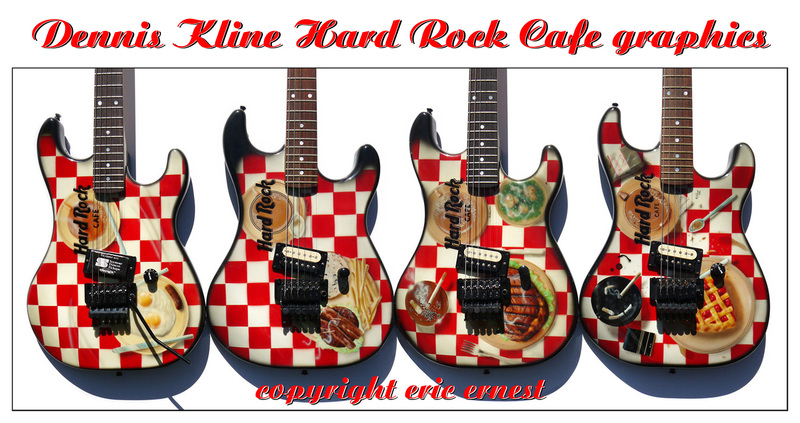 1980's Kramer Hard Rock cafe graphics by airbrush artist extraordinaire, Dennis Kline. 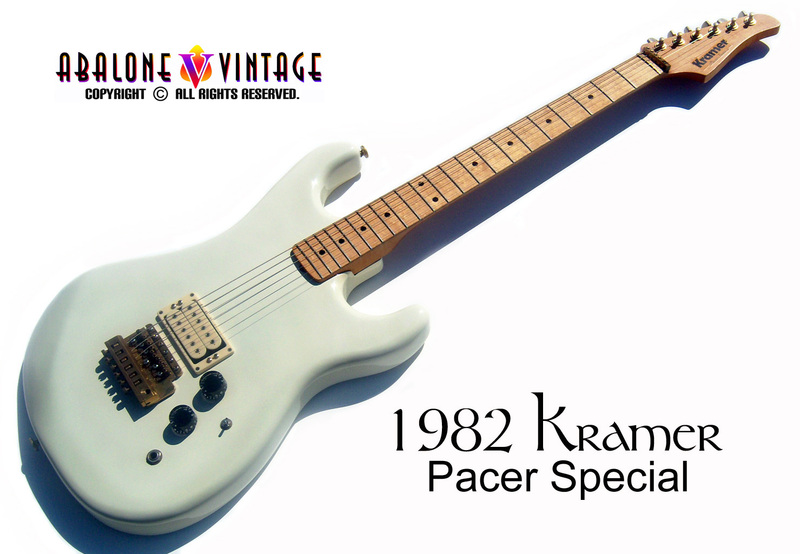 Arguably the koolest Kramer graphic ever! 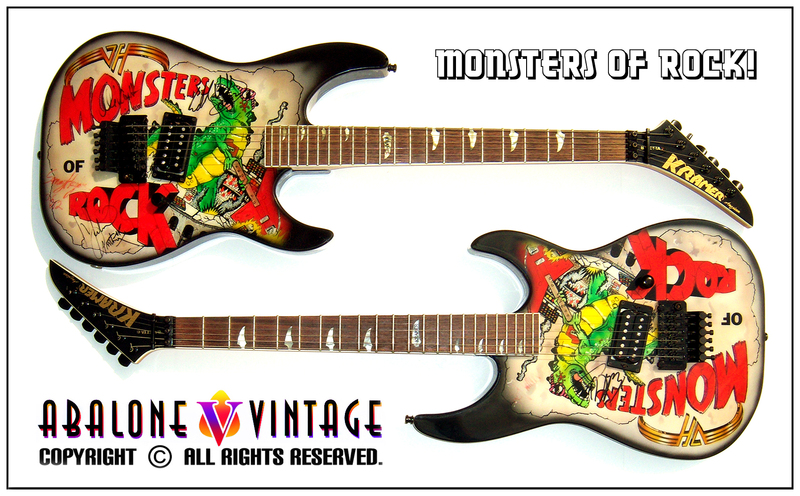 1988 Kramer Monsters of Rock graphic Van Halen Guitars! Roughly 50 were made. Another one of the all time greats! 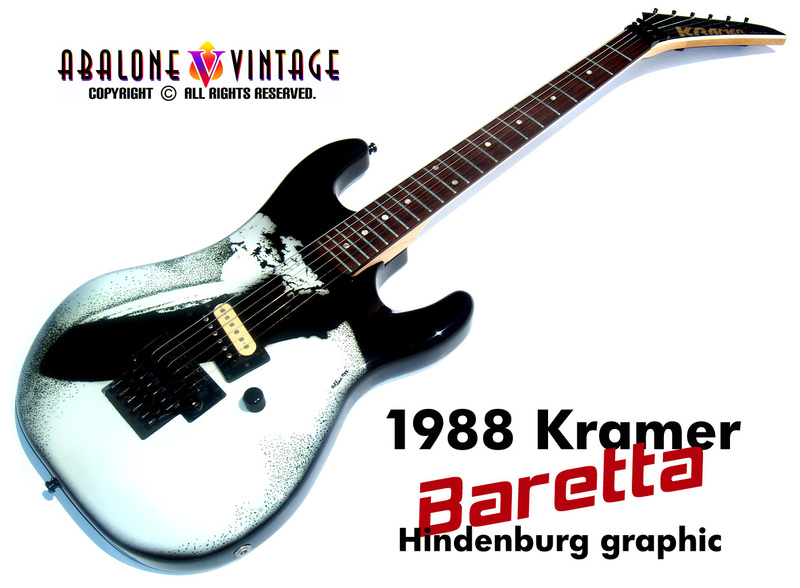 1988 Kramer Baretta Bon Jovi New Jersey Graphic Guitars. rest of us to enjoy. 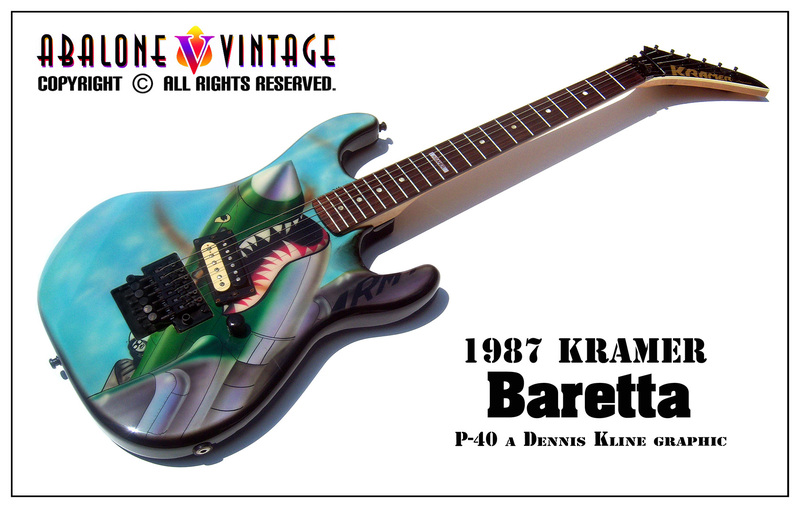 1987 Kramer Baretta with ultra kool Curtiss P-40 graphic by Dennis Kline. 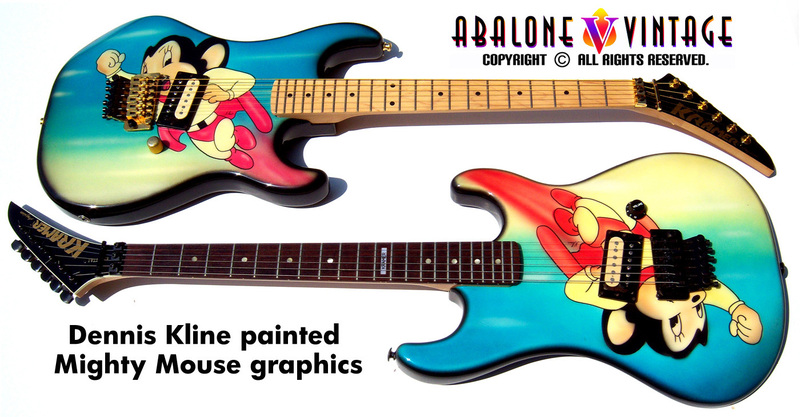 1987 Kramer Mighty Mouse graphics on a Baretta! "Here I am to save the day!" LOL! 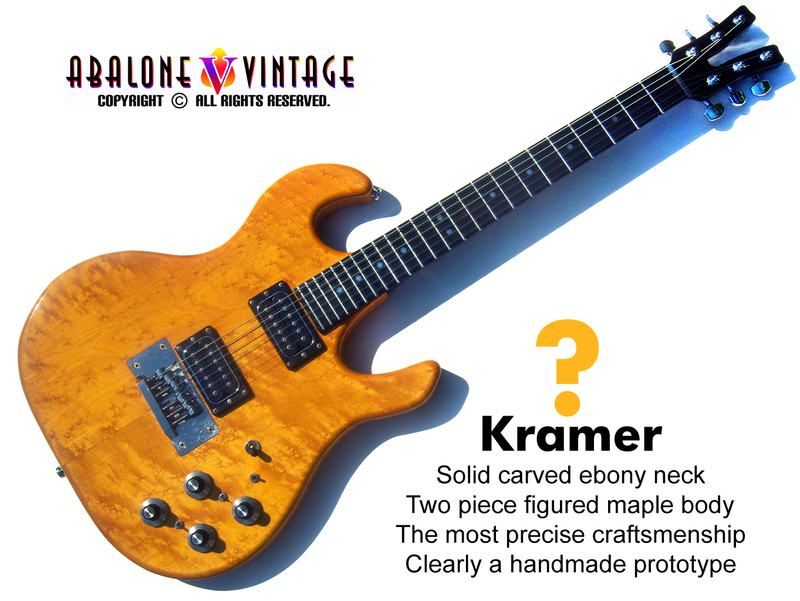 Kramer Triax model AKA Kramer Triaxe guitar. 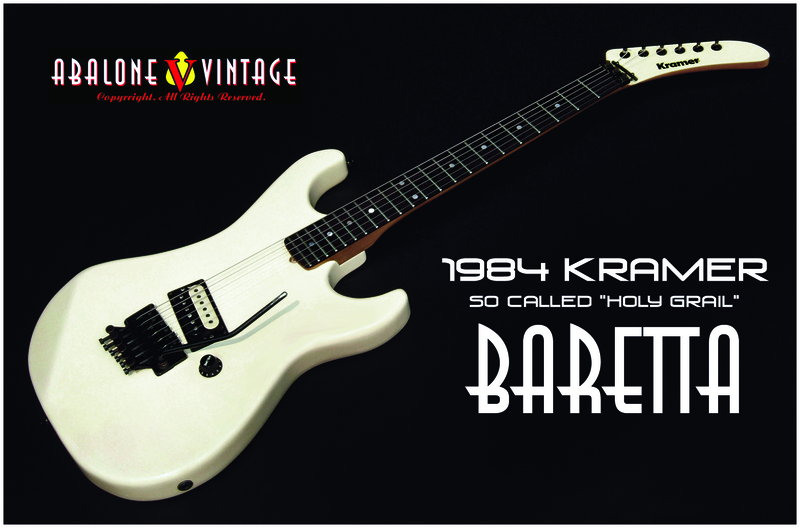 Vintage Guitar Magazine! Thanks, Michael! 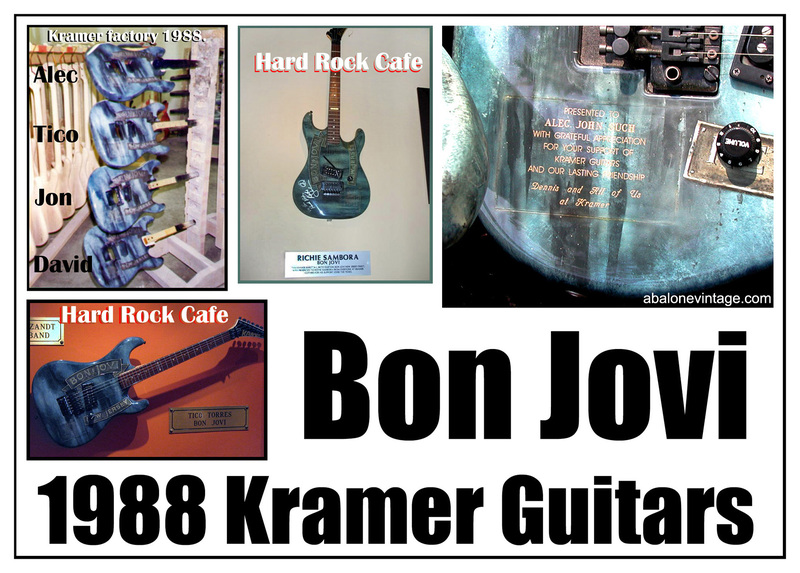 This guitar was also used in the Boston Museum guitar exhibit. One of 12 or so made. This is the most common color by far. 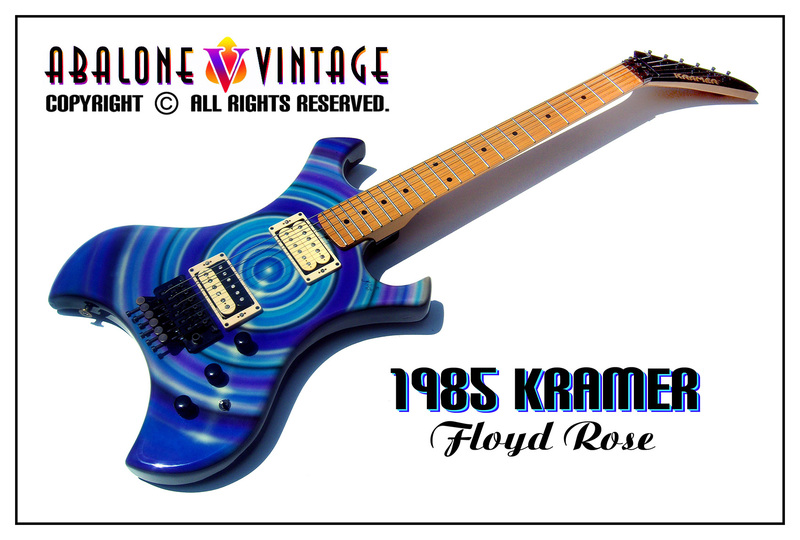 1985 Kramer Floyd Rose Heavy Metal Target graphic by Dennis Kline. 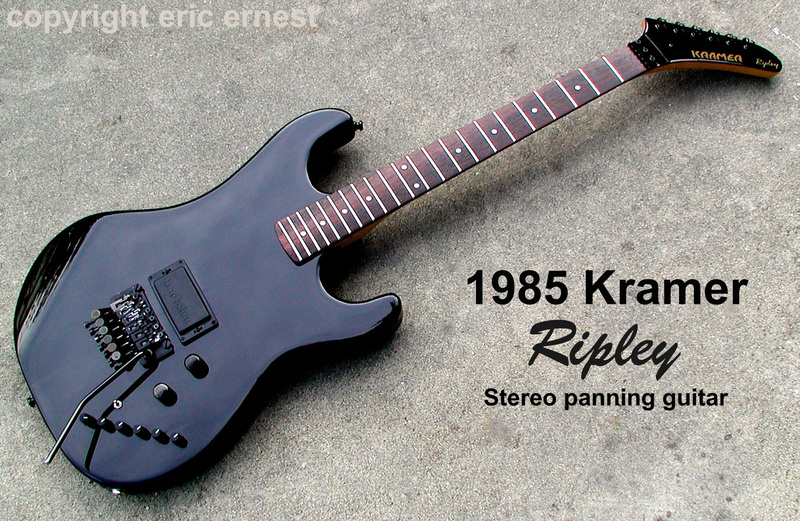 Vintage 1985 Kramer Ripley guitar. 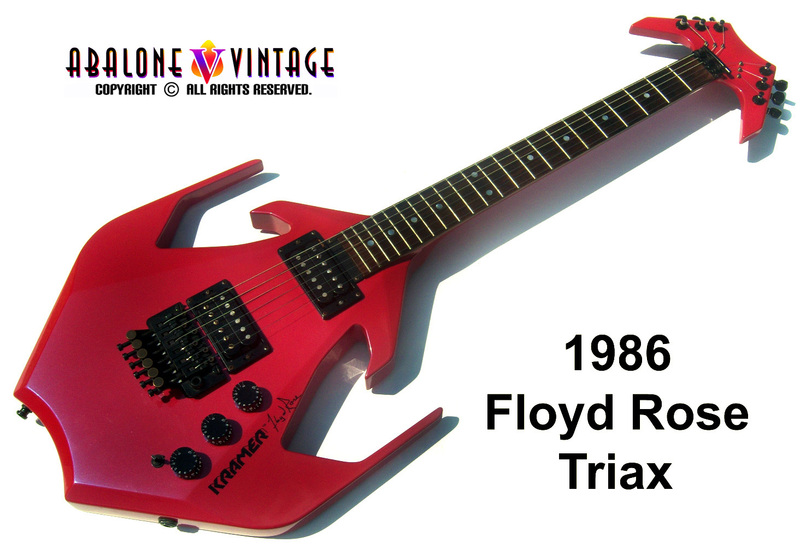 used on the terrific song, "Top Jimmy." to as the "Holy Grail." Um, I'm thinking no. LOL! 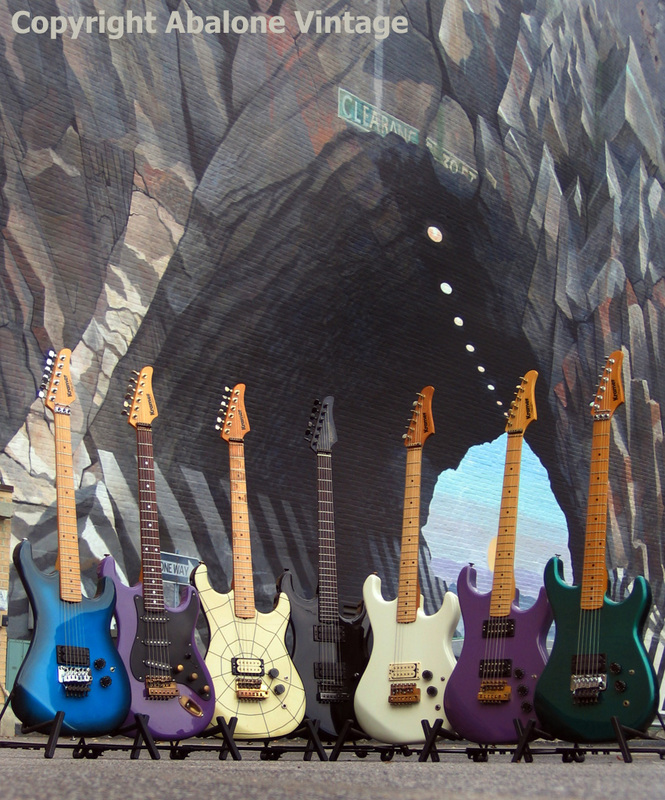 Kramer Pacers guitars from 1982 and 1983 with "beak"
headstocks in front of Blue Sky's infamous mural, "Tunnel vision." the most expensive model you could purchase. 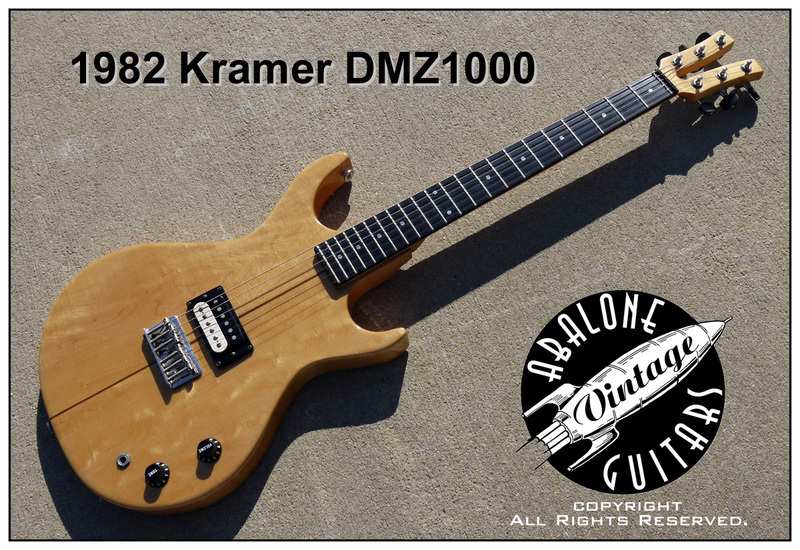 factory oiled neck, and double white Schaller pickup. 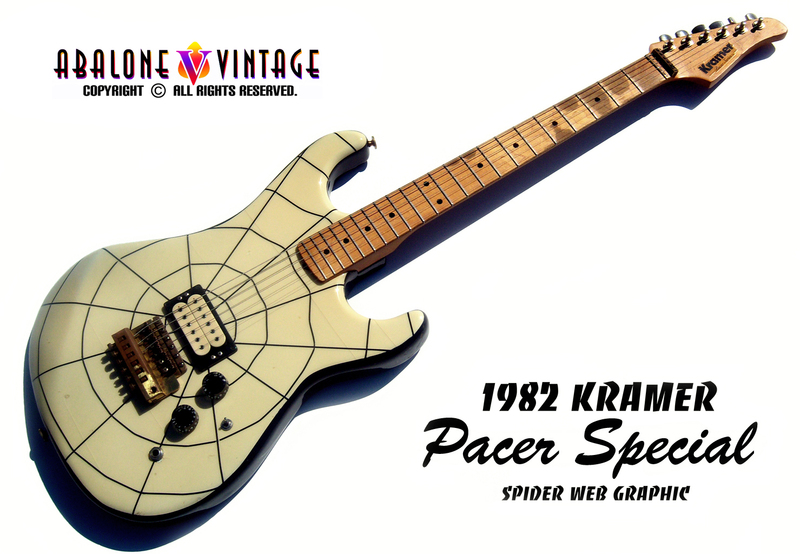 1982 KRAMER Pacer Special guitar with early spider web graphic. 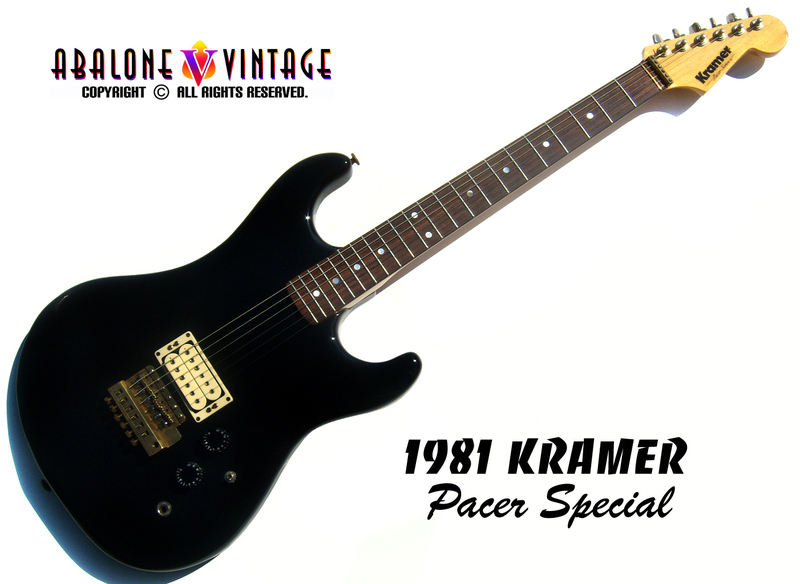 1982 Kramer The Pacer guitar. 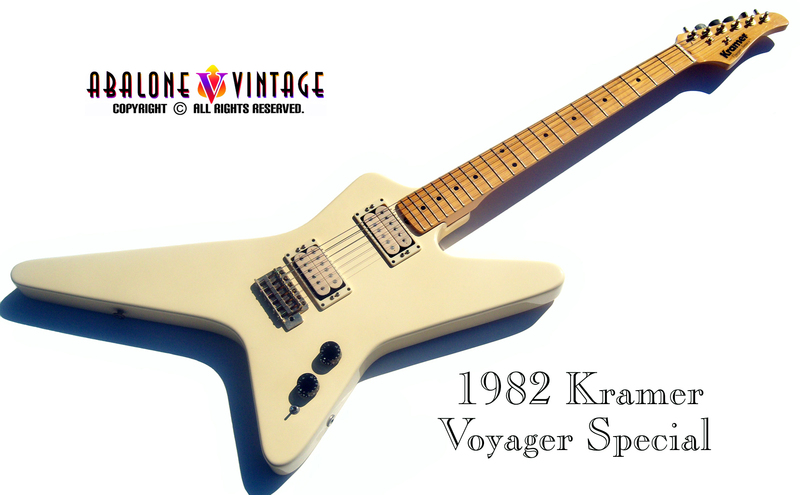 1982 Kramer Voyager guitar with double white Schaller "Golden 50" pickups on a clean cream Voyager! 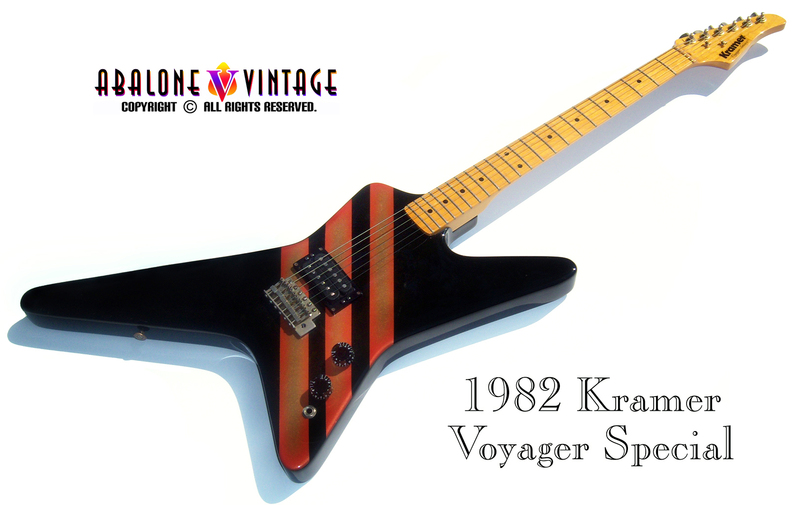 1982 Kramer Voyager guitar in rare red and gold 3 stripe graphic. 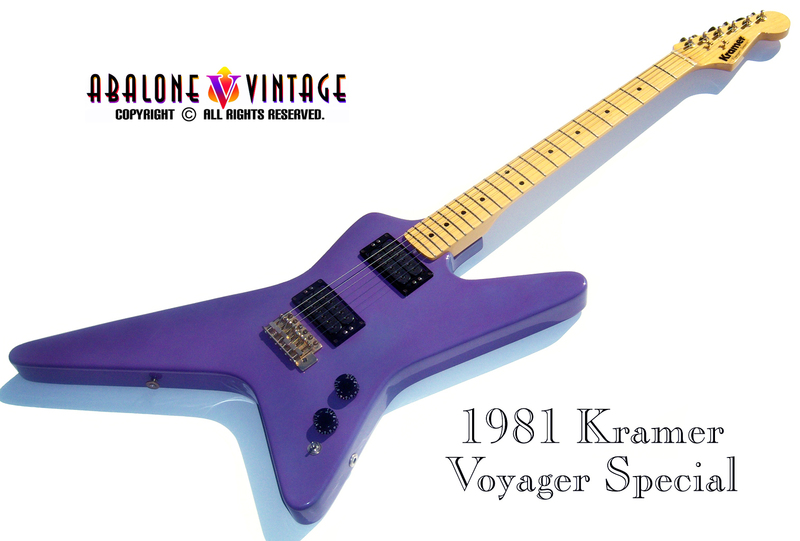 Vintage 1981 Kramer Voyager guitar in ultra hip melga purple. 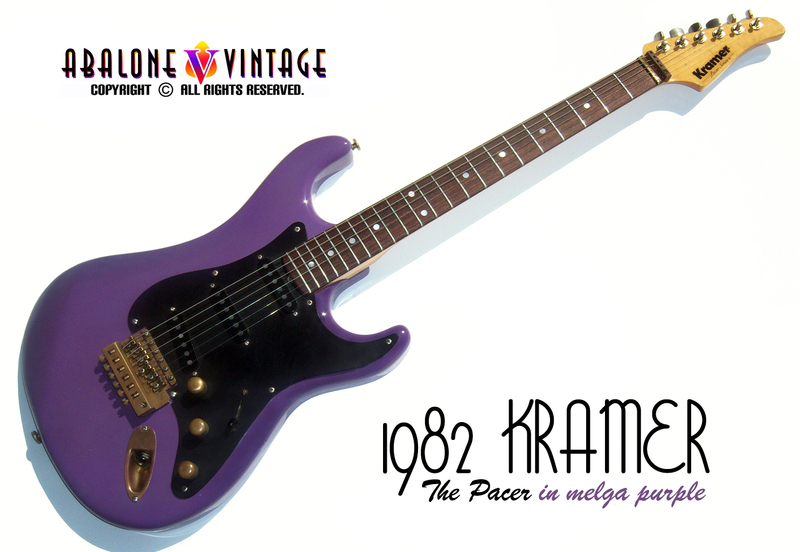 This is probably the only melga purple Strathead Voyager around! 1981 Kramer Pacer Special guitar. 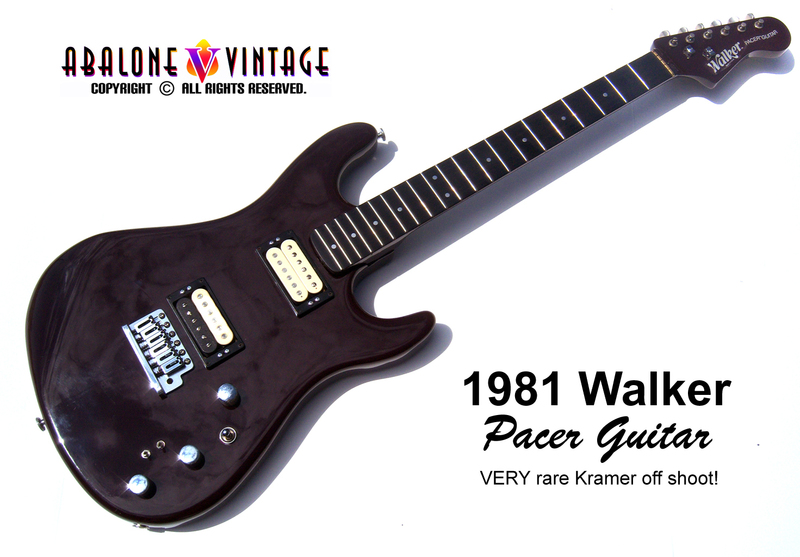 Very rare Schaller non-trem. Kramer graphics in near MINT condition!!!!!! accurately capture with a camera! 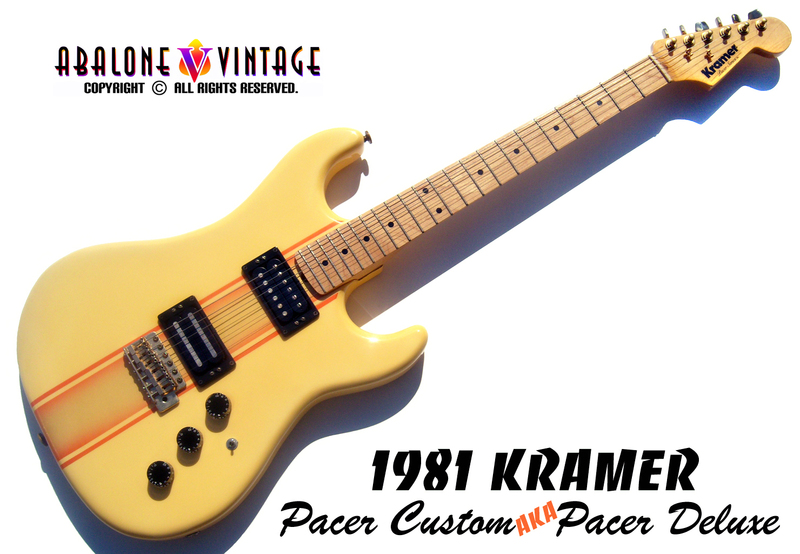 1981 Kramer Pacer Custom guitar AKA the Pacer Deluxe model. 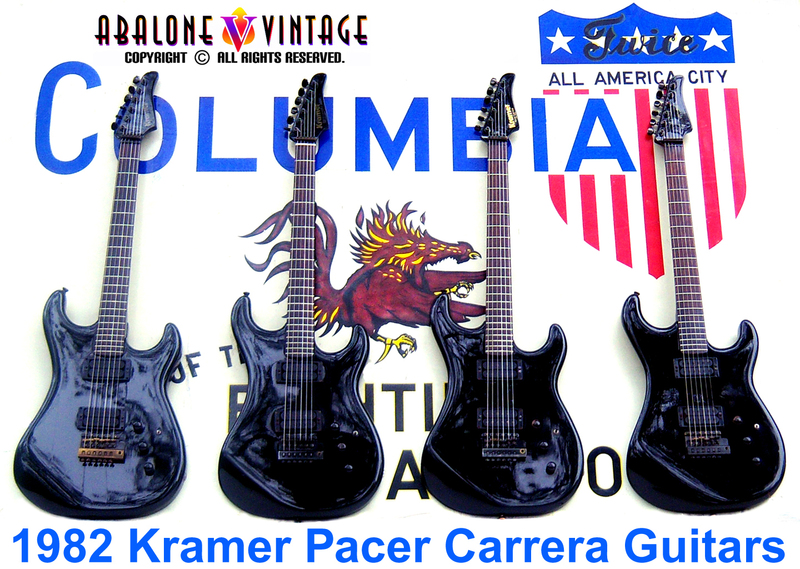 that their San Dimas Charvel Strathead counterparts! 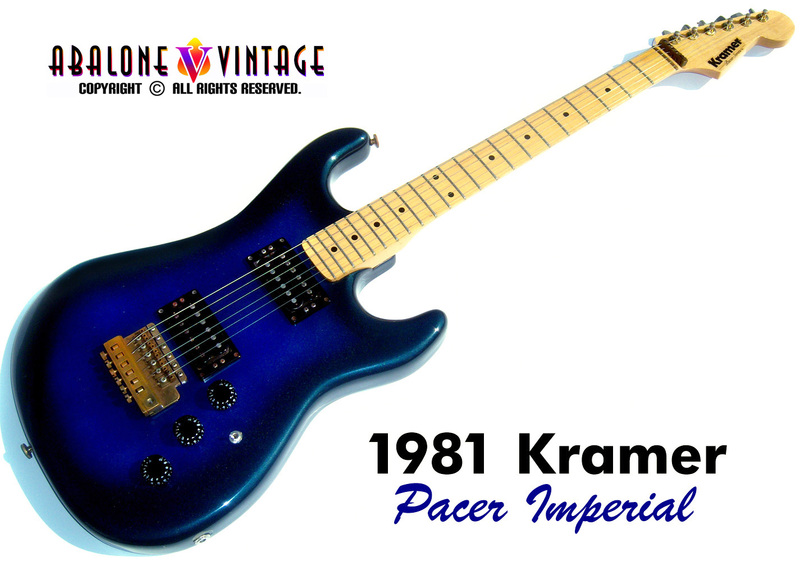 1981 Kramer Pacer Standard guitar. 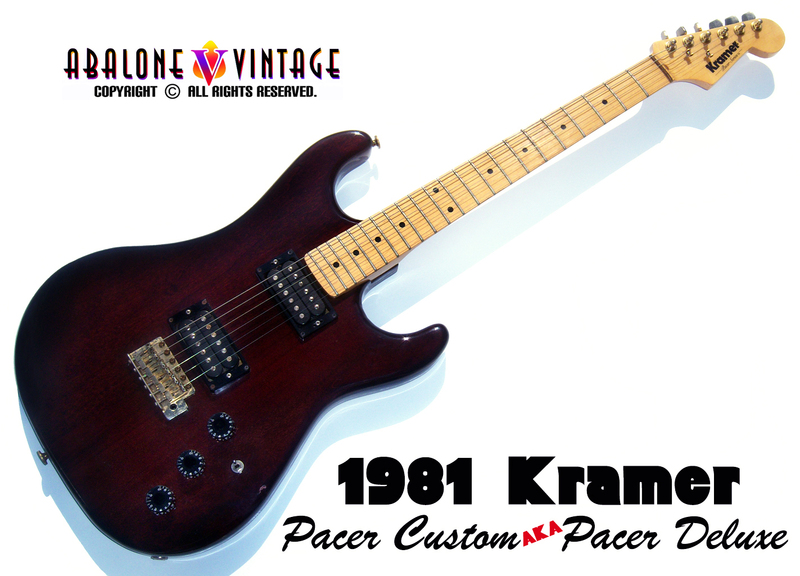 One of the FIRST wooden neck Kramer Pacer guitars. control rout as the aluminum neck guitars. a dealer in England....It came back! 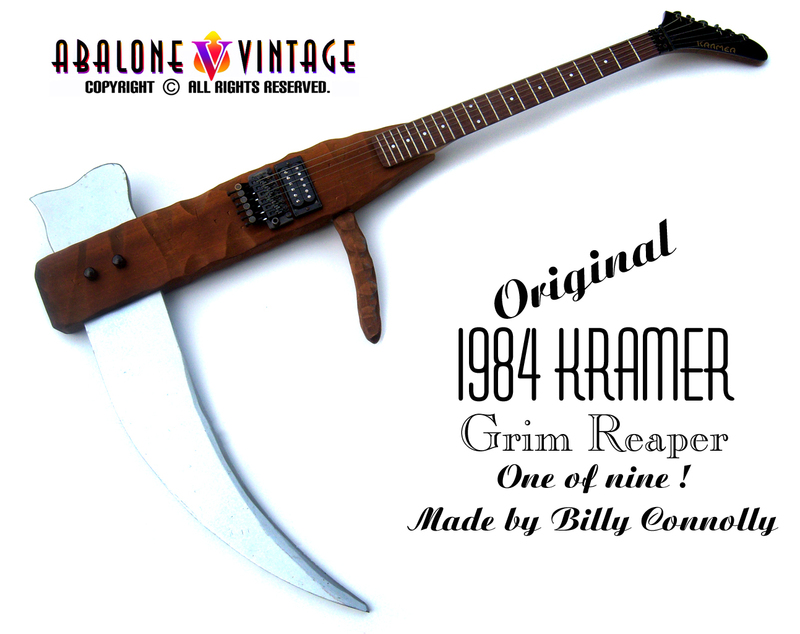 One of TWO known to exist!!!! 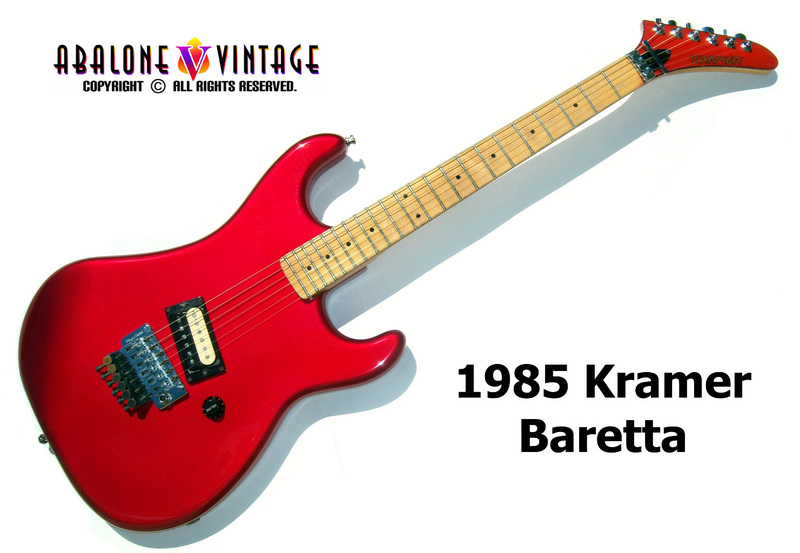 1982 Kramer Prototype guitar made by Paul Unkert. Wood neck with phenolic fingerboard. Well, at least one escaped the executioner! The only wood neck DMZ made. This thing SOUNDS great. This is an unknown. May have been made by Phil Petillo. Bridge is hand milled and countersunk into body.